Search Engine Optimisation services to help you get found online. 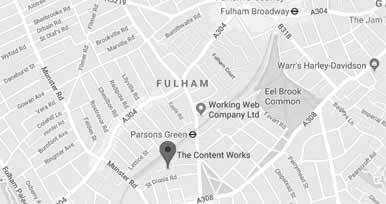 London SEO consultancy specialising in technical website audits, competitor analysis, SEO and PPC. Our bespoke services help you prioritise your issues so you can outrank your competition, build your brand and increase your revenue. Getting your content in front of the right audience is the reason for SEO. Our on-page optimisation assesses and improves your website's ability to rank in search engines. 97% of mobile users search for a local business online. If you sell locally, you need to be found on Google Maps. We'll help you establish your listing, generate reviews and optimise your profile to drive more enquiries. Our detailed SEO analysis shows you all the keywords you're ranking for and checks over 100 factors that search engines use to rank your website, giving you the insight you need to increase your organic traffic and conversions. There are over 100 factors that can prevent your website from ranking well and delivering a flawless user experience. We check these factors and provide our prioritised recommendations.